One such memorial was raised at Wigginton in circa 1920 as a permanent testament to the sacrifice made by the 25 members of the local community who lost their lives in the First World War, and those that served during the conflict. A further bronze plaque was added to the memorial after the Second World War in honour of the memory of 11 residents who died in that conflict. In November 2016, The Secretary of State for Culture, Media and Sport decided to add Wigginton War Memorial to the List of Buildings of Special Architectural or Historic Interest. The memorial is now listed at Grade II. 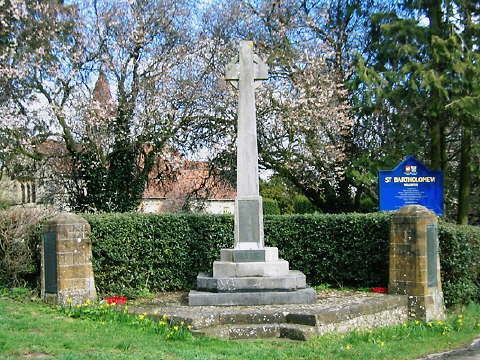 Wigginton War Memorial, remembering those from the local community who fell in the First and Second World Wars, was erected circa 1920. It is an eloquent witness to the tragic impact of world events on the local community, and the sacrifice it made during the conflicts of the C20. The Celtic cross and tapering shaft is set upon a plinth and base, flanked by ashlar columns, and approached by steps. It is a well-composed and elegant design that displays a high level of craftsmanship. The memorial holds group value with the Grade II*-listed Church of St Bartholomew with which it forms a strong visual composition, as well as the Grade II-listed lych gate.